Ralph Brennan’s Red Fish Grill, a casual seafood restaurant located on bustling Bourbon Street, attracts locals and tourists alike with its selection of fresh seafood dishes and imaginative takes on Louisiana classics. 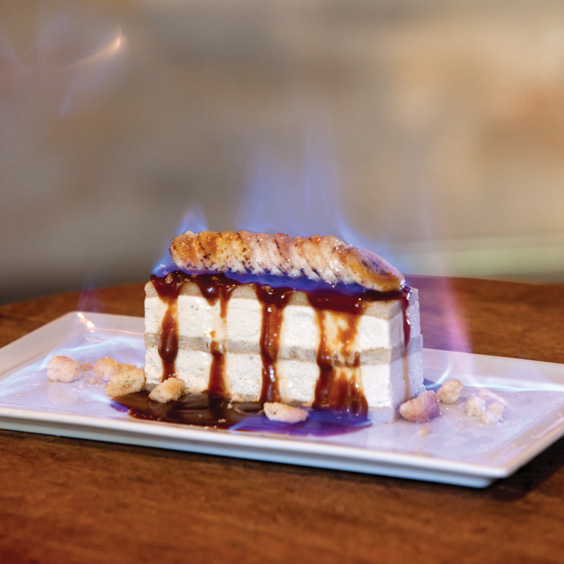 After feasting on the likes of BBQ Oysters and Wood Grilled Redfish & Lump Crabmeat, customers have their pick of New Orleans-inspired desserts, including Bananas Foster Ice Cream Cake, created by Corporate Pastry Chef Brett Gauthier. The ice cream cake consists of a chiffon banana cake layered with banana rum ice cream from New Orleans creamery Quintin’s Natural. The dessert is topped with brûléed bananas and a sugar cookie crumble, and it is flambéed tableside to give diners part of the traditional Bananas Foster experience. The Ruby Slipper Café has been a popular spot for New Orleanians to get a casual yet decadent breakfast since 2008. Jennifer and Erich Weishaupt, who were engineers with little restaurant experience, opened the restaurant after Hurricane Katrina. Eight years later, their neighborhood breakfast spot has expanded to six locations in three states. 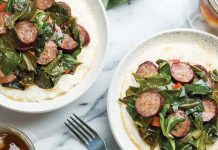 The Ruby Slipper highlights flavors from New Orleans and the South, offering items like Eggs Cochon, Chicken St. Charles, and Bananas Foster Pain Perdu. The pain perdu is made with French bread, a traditional egg wash, Foster sauce, banana slices, and raisins. 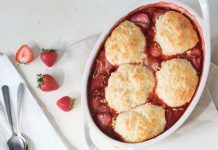 It is flambéed and served with two slices of applewood smoked bacon. 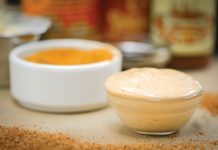 “We really like the saltiness of the bacon against that sweet Foster sauce. I think it makes the dish,” says Jennifer. The dish earned its place on the menu in late 2008 when then-chef Chris Belou decided to switch their French toast base from brioche to French bread and make it with a Bananas Foster flavor profile. Jennifer was convinced it wouldn’t work, but she tried it anyway. “I literally took one bite, and I was like, ‘OK, change the menu ’” Jennifer says. Keller’s Bakery Downtown has been a mainstay for sweet treats in Acadiana for more than a century. Although it was established in Abbeville in 1895, Keller’s has been operating in downtown Lafayette since 1929, when current owner Kenneth Keller’s parents moved from New Orleans with $400 to open the new bakery. Today, nearly everything produced at the bakery is made from scratch. “We have recipes that are 125 years old that we still use today with very little modification, ” Kenneth says. While the bakery also sells items like cakes and pies, king cakes are its bestsellers. 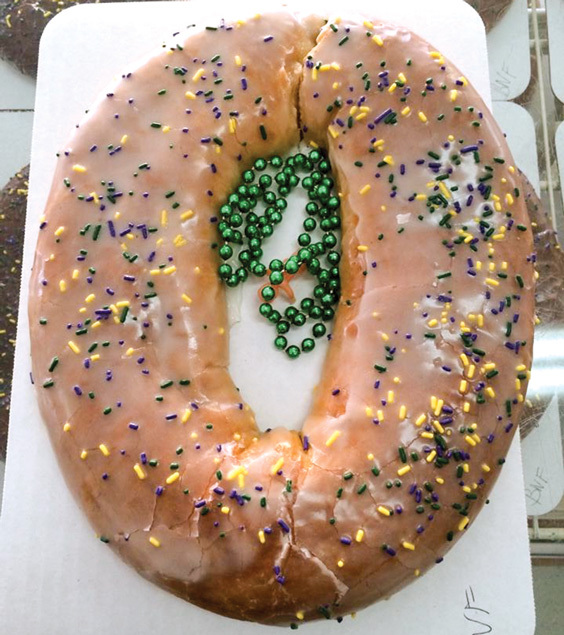 This past Carnival season, Keller’s sold around 15,000 king cakes, both at the bakery and through phone orders. Keller’s offers about 15 different king cake varieties, including amaretto walnut, butter pecan, and Bananas Foster. Keller’s introduced its Bananas Foster flavor in the late 1990s when Mike Foster was Louisiana’s governor. It is made using Danish pastry dough, a cream cheese-based filling, pecans, and fresh bananas. The finished product is drizzled with icing as soon as it comes out of the oven and topped with festive sprinkles.